In the last blog we talked about Google Analytics as one of the ten tips for Digital Marketing. 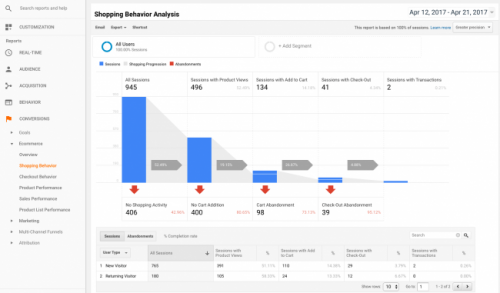 In this blog we are going to focus specifically on it and dig a bit deeper to see how Google Analytics can help improving a business’ performance. First of all, we want to provide a definition of what Google Analytics is, then we will cover how Google Analytics works, as well as some benefits of using this software, and finally we will provide a video going over all the information covered on this post ; according to TechTarget, Google Analytics “is a free Web analytics service that provides statistics and basic analytical tools for search engine optimization (SEO) and marketing purposes.”. Initially, Google bought Urchin Software Corporation in 2005 and used to build Google Analytics around what already existed by then. Traffic: Google Analytics allows you to check how many visitors came to your page, or where they came from(organic vs paid). This is very useful because you can see for example, whether a digital advertising campaign is performing well or not according to the number of users it brought to the site. This valuable information can serve to make the necessary adjustments on the website or make key decisions that will take you to the desired goals. Keywords: the use of keywords is a very good KPI, it tells you what keywords people are using to find your site, so if the keywords they use match those keywords on your website, it means you are doing a great job. If the keywords don’t match, try to find a good set of keywords that best combines the content on the site with what users are typing to find it. Keyword reports are also useful because you can look at those keywords that are driving most of your traffic and those which are not performing that well. Bounce Rate: bounce rate is the term used to describe a situation when a user leaves your website having visited just one page. A high bounce rate means that most of the people leave that page without taking any action, this would probably mean that visitors are not finding the information they want or are struggling to navigate through the site. Understanding and analyzing why a page has a high bounce rate is essential before modifying the content and structuring the site, thus reducing these rates and therefore increasing engagement. Real Time: this feature of Google Analytics is very interesting because it allows you to see how many users are in your website, what pages they are visiting, and overall how they are interaction with your website. Audience: if you want to target people from a specific location you may advertise to them via Facebook for example, but how do you know if they are engaging with the ad? Within “Audience” Google Analytics offers different sections that let you find out about audience demographics (gender-age), interests, geo (location-language), behavior, or technology among others. All thisinformation can be very helpful when analyzing an online campaign so you can see if website visitors are coming from your targeted audience or if you need to make some adjustments. Goals: Google Analytics allows you to create your own goals or select predetermined goals such as session duration, newsletter subscriptions, amount of dollar made from sales, etc. This is a very useful tool as you can track your website performance and identify what works and what does not work, coming up with solutions and then improving the web’s performance. These are just a few benefits any company can take advantage of when using Google Analytics however, from Invermedia Advertising we encourage you to complete the official course to find more about this awesome tool. In addition, we also would like to provide you with an extensive glossary containing the most important and useful terms to get familiarized with Google Analytics. Check out this video where we explain how Google Analytics works and how to navigate through it!! As always, we encourage you to leave a comment below, tell us what you liked and what you didn’t like. Also, don’t forget to contact us if you have any doubts or want more information about any related topic, we are glad to help you.